The Cubs have a chance to clinch the Crosstown Cup outright on Sunday with a win over the White Sox. After being throttled 10-4 on Friday, the Cubs got their revenge over the White Sox on Saturday with an 8-3 win to set up a series rubber match and provide a chance to win the Crosstown Cup outright (they still retain with a tie but what fun it that?) with a win on Sunday. A misplayed fly ball by Ryan LaMarre opened the floodgates for the Cubs and they never looked back. 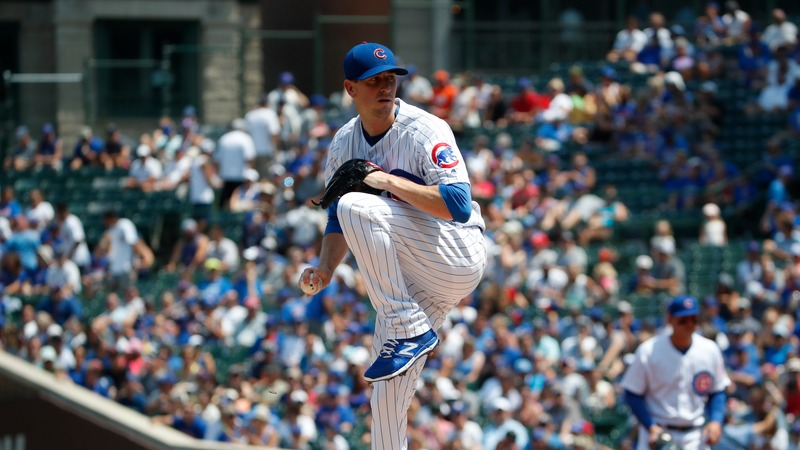 Now, a pitching duel between Kyle Hendricks and Carlos Rodon should be the marquee matchup of the series. __MORE:__ [Who should be on Cubs postseason roster? ](https://www.betchicago.com/cubs-postseason-roster-david-bote-addison-russell) ## [Odds: Cubs (90-64) -192 at White Sox (61-93) +177](https://www.betchicago.com/mlb-betting/coverage/305bff44-cd9b-4cc8-a7db-3e819076200b/odds); Total: 8.5 (OVER +105) __Pitching preview:__ Cubs RHP Kyle Hendricks (12-11, 3.58 ERA) vs. White Sox LHP Carlos Rodon (6-6, 3.22 ERA) 2:10 p.m. ET/1:10 p.m. CT The last time that the Cubs and White Sox met, Carlos Rodon was still working his way back from offseason shoulder surgery. Since his return, the White Sox have been most competitive when he's on the mound. It's impossible to mention the success (the ERA) without the reality that his 4.84 FIP (fueled by a career-low strikeout rate) suggests there's some good fortune involved. But that's been the case all season for Rodon and there haven't been any signs that he's going to experience a major dropoff. Meanwhile, Hendricks is playing his best baseball of the season and has gone six straight starts without giving up more than two earned runs. That helped drop his ERA from 4.11 to 3.58 during that stretch. However, Hendricks has struggled historically against the White Sox. Current White Sox hitters are slashing .371/.394/.516 against him in 68 career plate appearances. __Play and win:__ [Crosstown Classic Challenge](https://betchicago.chalkline.com/games/cubs-whitesox-mlb) __Trends:__ The White Sox are 4-1 SU against the Cubs in their last five matchups with Hendricks. OVER has hit in four of the last five games between the Cubs and White Sox.